↑ Wyre Davies (15 December 2010). "BBC News – Tunisia: President Zine al-Abidine Ben Ali forced out". BBC News. สืบค้นเมื่อ 2011-01-14. ↑ "Uprising in Tunisia: People Power topples Ben Ali regime". Indybay. 16 January 2011. สืบค้นเมื่อ 2011-01-26. ↑ Ferris-Rotman, Amie (24 January 2011). "Suicide bomber kills 31 at Russia's biggest airport". Reuters. สืบค้นเมื่อ 24 January 2011. ↑ "Multiple deaths as quake strikes Christchurch - ABC News (Australian Broadcasting Corporation)". abc.net.au. 22 February 2011. สืบค้นเมื่อ 22 February 2011. ↑ "Tsunami warning center raises magnitude of Japan quake to 9.1". Honolulu Star-Advertiser. March 11, 2011. สืบค้นเมื่อ March 11, 2011. ↑ "Japan earthquake live blog: Death toll rises amid widespread destruction". CNN blog. TimeWarner. 12 March 2011. สืบค้นเมื่อ 12 March 2011. ↑ Kirkpatrick, David D.; Bumiller, Elisabeth (19 March 2011). "France Sends Military Flights Over Libya". The New York Times. สืบค้นเมื่อ 19 March 2011. ↑ "Gbagbo, wife in Ouattara's custody in I.Coast: UN | Top News | Reuters". Af.reuters.com. 11 April 2011. สืบค้นเมื่อ 11 April 2011. ↑ "South Sudan: New nation". BBC. BBC. 9 July 2011. สืบค้นเมื่อ 9 July 2011. ↑ Cheryl L. Mansfield (27 กรกฎาคม 2554). "STS-135: The Final Voyage". NASA. สืบค้นเมื่อ 22 ธันวาคม 2554. ↑ Duxbury, Charles; Hovland, Kjetil (23 July 2011), "Savage Terror Attacks", The Wall Street Journal, สืบค้นเมื่อ 23 July 2011, ...at Least 87 Dead . ↑ Birnbaum, Michael; Goodman, J David (22 July 2011), "At Least 80 Are Dead in Norway Shooting", The New York Times, สืบค้นเมื่อ 23 July 2011 More than one of |last1= และ |last= specified (help); More than one of |first1= และ |first= specified (help). 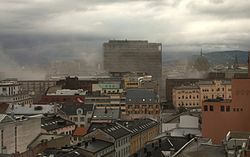 ↑ "Norway attacks: At least 87 dead in shootings at youth conference, Oslo explosion", The Washington Post, 22 July 2011, สืบค้นเมื่อ 23 July 2011, ...at least 80 people shot to death at a youth political conference outside Oslo after a massive explosion in the capital’s government district killed at least seven people, according to Norwegian police . ↑ "Live - Gaddafi silent as rebels enter Tripoli". RTE. RTE. 22 August 2011. สืบค้นเมื่อ 22 August 2011. ↑ "NTC claims capture of Gaddafi - Africa". Al Jazeera English. 2011-10-04. สืบค้นเมื่อ 2011-10-20. ↑ "BBC News - Col Gaddafi killed". Bbc.co.uk. สืบค้นเมื่อ 2011-10-20. ↑ "Gaddafi dies of wounds - NTC official | Reuters". Uk.reuters.com. สืบค้นเมื่อ 2011-10-20. ↑ "Muammar Gaddafi 'killed' in gun battle - Africa". Al Jazeera English. 2011-10-04. สืบค้นเมื่อ 2011-10-20. ↑ "Footage shows Gaddafi's bloodied body - Middle East". Al Jazeera English. 2011-10-04. สืบค้นเมื่อ 2011-10-20. ↑ "Leaders agree eurozone debt deal after late-night talks". BBC News. 27 October 2011. สืบค้นเมื่อ 27 October 2011. ↑ Bhatti, Jabeen (27 October 2011). "EU leaders reach a deal to tackle debt crisis". USA Today. สืบค้นเมื่อ 27 October 2011. ↑ "Population seven billion: UN sets out challenges". BBC News. 2011-10-26. สืบค้นเมื่อ 2011-10-30. ↑ "General Conference admits Palestine as UNESCO Member". 2011-10-31. สืบค้นเมื่อ 2011-12-11. ↑ Dunn, Marcia (26 November 2011). "NASA launches world's largest rover to Mars". The Globe and Mail. Cape Canaveral, Florida. The Associated Press. ↑ "US flag ceremony ends Iraq operation". BBC. สืบค้นเมื่อ 15 December 2011. ↑ Easley, Jonathan (December 15, 2011). "Panetta marks Iraq war's end in Baghdad". DEFCON Hill – The HILL’S Defense Blog. สืบค้นเมื่อ 15 December 2011. ↑ "US lowers flag to end Iraq war". The Associated Press. December 15, 2011. สืบค้นเมื่อ 15 December 2011. ↑ "U.S. formally ends Iraq war with little fanfare". The Associated Press. December 15, 2011. สืบค้นเมื่อ 15 December 2011. ↑ Mak, Tim (December 15, 2011). "Leon Panetta marks end of Iraq war". POLITICO.com. สืบค้นเมื่อ 15 December 2011. หน้านี้แก้ไขล่าสุดเมื่อวันที่ 11 เมษายน 2562 เวลา 02:11 น.